There are few public school systems in America that have been more harmed by what Diane Ravich aptly dubbed “corporate education reform” than those in Denver, Colorado. 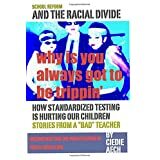 Ciedie Aech tells the story of a professional educator working in the horrific and unstable environment that developed with the extra-legal federal take-over of public schools. In reality, this is a heart wrenching story, but Aech’s sarcastic humor turns it into a delight. Any teacher in America’s public k-12 system who reads “Why is you always got to be trippin” will immediately recognize many scenes Ciedie delightfully paints while telling this dreadful story. “One day when noise from unsupervised students caught my attention, I stepped into the hallway to find a group of boys throwing friendly punches outside a neighboring classroom.